City Council voted 4-3 tonight to increase water and sewer rates by 5 and 9 percent effective October 1. The rates were anticipated to increase as of July 1, but Mayor Jim Clinton and Councilors Sally Russell, Doug Knight, and Jodie Barram expressed concerns about hitting ratepayers with the increase before the October 15 end of irrigation season. “There is a segment of the community that really is struggling a little bit. We need to keep that in mind; the timing is really important,” Russell said, noting that the city sends out water/sewer shut-off notices to about 1,400 customers—about 5 percent of the service base—each month. Clinton advocated for putting the rate hike on pause until the rate structure is reconfigured later this year, but accepted the three month delay. “I would like to see rate increase deferred until the rate structure is figured out,” Clinton said, adding that he had graphed the rate increase over the past several years and found an increase of about 72 percent. During that same period, he said, the median income in Benddecreased by about 1 percent. The other councilors said they would prefer the earlier date. 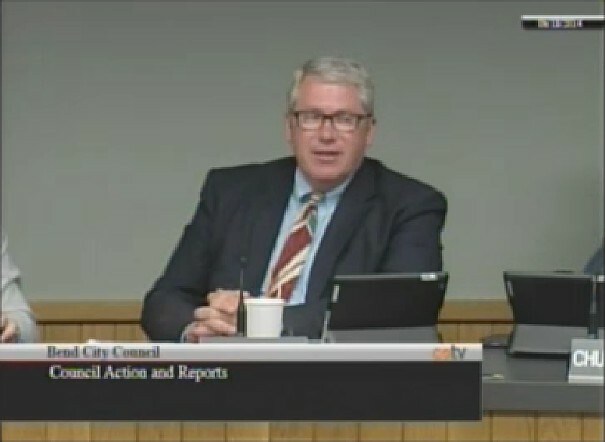 While Councilor Mark Capell said he agrees that the rate structure is wrong, he took issue Mayor Clinton’s graph. A time, he argued, the city wasn’t collecting enough to build up the infrastructure that was needed. With growth comes a greater need for infrastructure improvements and the funds to pay for it. City Manager Eric King said that pushing back the increase will cost the city approximately $400,000 in lost rates, but added that city has sufficient reserves to move forward with planned infrastructure projects in the meantime. • A number of year-end budget related items. There was no public comment and little to no Council discussion on most items. • The purchase of six new fire trucks. • The Housing and Urban Development (HUD) Consolidated Plan and Action Plan. • The transfer of franchise from Bend Broadband to TDS Broadband LLC.